Celiac.com 08/24/2012 - Tired of the standard choices for gluten-free pasta? If researchers at the University of Brazil have their way, you may soon be enlivening your current gluten-free choices with pasta made from the flour of green bananas. The researchers included Renata Puppin Zandonadi, PhD, Raquel Braz Assunção Botelho, PhD, Lenora Gandolfi, PhD, Janini Selva Ginani, MSc, Flávio Martins Montenegro, MSc, and Riccardo Pratesi, PhD. According to an article in the Journal of the Academy of Nutrition and Dietetics, the team found a way to make pasta out of green banana flour. The flour is completely gluten-free, and the pasta compares favorably with pasta made from whole wheat, according to taste test results. 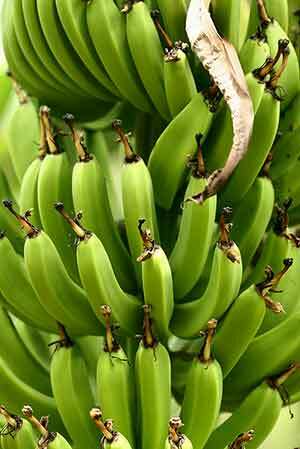 Currently, green bananas are regarded an undesirable product, with low commercial value, and limited industrial use. In an effort to change that reality, the researchers set out to develop and analyze a gluten-free pasta made with green banana flour. When they tested their finished product, they found "no significant difference between the modified pasta and standard samples in terms of appearance, aroma, flavor, and overall quality," study researcher Renata Puppin Zandonadi, PhD, of the University of Brazil, said in a statement. For the study, researchers had 50 people without celiac disease, and 25 with celiac disease, taste whole wheat pasta made with eggs, and compare it with pasta made from green banana flour, egg whites, gums and water. Both the test group with celiac disease and the group without celiac disease reported that the banana flour pasta tasted better overall than the whole wheat pasta. If the project pans out, it could be a win-win-win, offering banana growers and pasta product makers a way to expand their markets, and offering consumers of gluten-free pasta a new and delicious alternative. What do you think about the idea of gluten-free pasta made from green bananas? Share your comments below. Will New Celiac Drugs Power Treatment Market to $550 Million by 2023? I can now only eat corn pasta - the rice pasta is so mushy as to be inedible, even when cooked al dente. So if they can come up with something closer to "real" pasta - GREAT !! OK, but how digestible is it? I would never eat a green banana because I feel it would be more resistant to breaking down and being absorbed by the gut, which would create more food for the bacteria way down below, causing a lot of gas. Often folks with celiac disease don't have the optimal amount or types of gut bacteria to handle this sort of unripe food. Save it for those with diabetes who need resistant start to slow food from turning to blood sugar. Sounds good to me. I love bananas. Sounds great! Hope it works out. Sounds Fantastic! I am all for finding a better gluten-free pasta. Hi Susan, it will be digestible. People in the Caribbean have been eating boiled green bananas and green banana porridge for centuries. I am celiac and I eat them. I just had the most delicious green banana porridge made with coconut milk last month, very nutritious also. Google and you will see recipes and nutritional info. This is great. I'm pretty sure that a flour made out green plantains would be good. In Puerto Rico we make "pasteles", they are made with the masa from green plantains and green bananas. I think this sounds great and would DEFINITELY try it! And "dappycharlie" - I can't eat the rice pastas either - texture is AWFUL - and I am allergic to corn but, LOVE the texture and taste of the potato, soy and rice blend pasta. Don't know if I am allowed to say brands but, Bionaturae is our favorite! Sounds interesting! And hopefully better-cooking and -tasting than rice or corn pasta (which usually turns out mushy), or quinoa pasta, which cooks and cooks and still doesn't seem done! And, just as long as it doesn't TASTE like green bananas, it gives me hope! This is very promising. There is a company in Marin County working on introducing the flour commercially in the Bay Area. Stay tuned.